On Sunday 4 November 2018 the Ducati World Première in Milan (streamed live worldwide on www.ducati.com starting at 19.00 CET) will unveil, in addition to the latest Ducati models for 2019, the new Ducati e-MTB, the MIG-RR, an enduro bike born out of close collaboration with Italian company Thok Ebikes. The Ducati MIG-RR, which will make its public debut on the Ducati stand at EICMA 2018 (Fiera Milano Rho, 8-11 November), is a high-end e-MTB developed by Thok Ebikes specialists in close collaboration with Aldo Drudi’s D-Perf and the Ducati Design Center. 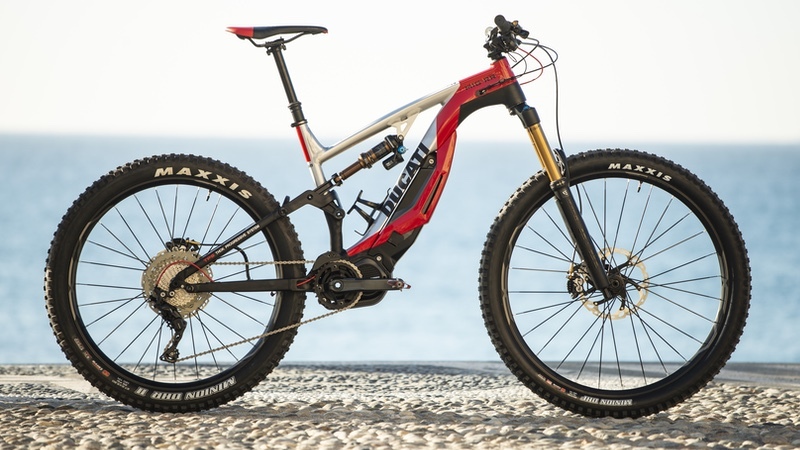 While the new Ducati e-MTB is an offshoot of the MIG series produced by Thok, it features some unique technical solutions, such as: wheels with different diameters and suspension set-ups with different degrees of wheel travel (29″ and 170 mm at the front, 27.5″ and 160 mm at the rear). With high-level components – including FOX Factory Kashima suspension, carbon fibre Renthal handlebars, Mavic wheels, 4-caliper Shimano Saint brakes and an 11-speed Shimano XT gear set – the MIG-RR features a Shimano Steps E8000 motor. This puts out 250 Watts with a torque of 70N – powered by a 504 Wh battery. The battery is positioned underneath the down tube. According to Thok, the resulting low barycentre makes the Ducati MIG-RR an easy-to-ride yet precise bike even on the toughest terrain. The Ducati MIG-RR will be distributed throughout Europe via the Ducati dealership network starting from spring 2019. The bike can also be ordered online at www.ducati.com from January 2019 onwards.